As Director of Ocean Academy, BIOS’s suite of five local education programs, Kaitlin envisions what the Academy can achieve and works to ensure that the highest standards of education are met. Ocean Academy programs encourage Bermudian students aged 8 to 22 and educators across the island to draw on the natural environment and the world-class scientific research conducted at BIOS. Kaitlin makes certain that BIOS provides comprehensive and innovative education programs that inspire, empower and support students as they strive toward careers in the sciences. Kaitlin also spearheads the building and maintenance of relationships with schools, professional associations and non-profit organizations locally and internationally. In addition, she is actively involved in course and curriculum development for current and new international visiting groups and educator workshops. Before joining the BIOS team in 2010, Kaitlin was a coordinator and instructor for the Earth Institute Center for Environmental Sustainability (EICES) at Columbia University. 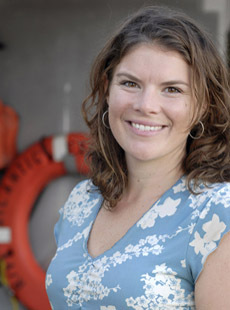 Kaitlin received her Master’s in Conservation Biology in 2008 from Columbia, where she remains on certificate faculty. Kaitlin holds a BSc. (Hons) in Marine Biology from Roger Williams University (’06) and is a graduate of the Duke Environmental Leadership Program (DEL) (’16).